An existential crisis for Turkey has been in the making for years, as I reported in my 2011 book, How Civilizations Die (and Why Islam is Dying, Too). During the past week, a perfect storm has overtaken Turkish policy, and threatens to provoke deep political instability. 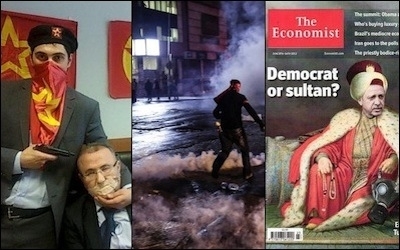 Turkey may become the region's next failed state. Erdogan has suffered public humiliation by both Washington and Moscow. There has to be a fall guy in the Middle East's film noir, and that unenviable role has fallen to Turkey. Prior to the bombings, the worst terrorist incident in modern Turkish history, Erdogan suffered public humiliation by Washington as well as Moscow. As Laura Rozen reported October 9 in Al-Monitor, Washington announced a 180-degree turn in its Syrian intervention, abandoning the Sunni opposition in favor of Syrian Kurds. The decision to refocus the beleaguered, $500 million Pentagon program from training and equipping a new force to fight IS in Syria to "equip and enable" rebel groups already fighting on the ground came after an interagency review of the train and equip program, US officials said. "A key part of our strategy is to try to work with capable, indigenous forces on the ground ... to provide them with equipment to make them more effective, in combination with our air strikes," Undersecretary of Defense for Policy Christine Wormuth told journalists on a call on the new strategy Oct. 9. Putin must certainly be innocent of the accusation that his air force has bombed the U.S.-trained "pro-democracy" freedom fighters, because the trainers themselves have admitted that the first lot on which one-tenth of the budget has been spent, i.e., $50 million, are exactly five in number, the rest having deserted after receiving their big family-support signing bonus and first paycheck, or after they were first issued with weapons (which they sold), or after first entering Syria in groups, when they promptly joined the anti-American Jabhat an-Nuṣrah, whose Sunni Islam they understand, unlike talk of democracy. The Russians forced Washington to find something credible on the ground to support, and Washington turned to the Kurds, the only effective fighting force not linked to ISIS or al-Qaeda. That was precisely the result Turkey had wanted to avoid; the Kurdish military zone in northern Syria links up with Kurdish-controlled territory in northern Iraq, and the two zones form the core of a prospective Kurdish state. Russia humiliated Turkey, meanwhile, by challenging Turkish fighters inside Turkish airspace, leaving NATO to protest loudly. Nonetheless the US and Germany have deactivated Patriot missile batteries–the only weapon system that represents a threat to Russian fighters–despite urgent Turkish requests to leave them in place. Russian fighters over Syria prevent the Turks from providing air cover for ISIS and other Islamist groups in Syria, as I noted Oct. 6 in our Chatham House Rules blog. M.K. Bhadrakumar observed in Asia Times Oct. 9, "Turkey's scope for maneuvering vis-à-vis Russia is actually very limited and it has no option but to reach an understanding with Russia over Syria." Less obvious but no less ominous is the deterioration of Sino-Turkish relations due to Ankara's covert support for the East Turkestan Independence Movement, a terrorist organization active among the Uyghurs of Western China. Despite official assurances, Turkey continues to provide safe passage to Turkey to thousands of Chinese Uyghurs via Southeast Asia, some of whom are fighting with ISIS in Syria. Thailand claims that Uyghur militants carried out the Aug. 17 bombing at Bangkok's Erawan shrine after Thailand sent 109 Chinese Uyghurs back to China. Erdogan has suffered not merely a collapse of his foreign policy, but a public humiliation by countries that backed his regime in the interests of regional stability–and this just before November's parliamentary elections. After the Kurdish-backed HDP party took 13% of the national vote in last June's elections and removed Erdogan's majority in parliament, Erdogan called new elections rather than accept a coalition government. Erdogan also revived military operations against Turkish Kurds in order to elicit support from Turkish nationalists, a transparent maneuver widely reported in the major media. Having already delayed the formation of a coalition government, analysts say, Mr. Erdogan is now buttressing his party's chances of winning new elections by appealing to Turkish nationalists opposed to self-determination for the Kurdish minority. Parallel to the military operations against the Kurds has been an effort to undermine the political side of the Kurdish movement by associating it with the violence of the P.K.K., which has also seemed eager to return to fighting. Observers agreed that the Ankara blast was probably linked to a decision by the PKK rebels to suspend hostilities with Ankara. The PKK had hinted in recent days that it would declare a new ceasefire in order to boost the HDP's election chances. The people behind the attack wanted to "prevent the ceasefire" from coming into effect, respected journalist Kadri Gursel tweeted. The PKK's ceasefire announcement became public shortly after the attack, but the decision by the rebels had probably been taken before. In short, Erdogan now contemplates American heavy weapons in the hands of Syrian Kurds; the end of Turkey's ability to provide air support for Sunni rebels in Syria; a Russian campaign to roll up the Sunni opposition, including Turkey's assets in the field; and a collapse of his parliamentary majority due to an expanding Kurdish vote at home. Whether the AKP government itself ordered the Ankara bombing, or simply looked the other way while ISIS conducted the bombing, both Turkey and global opinion will assume that the ghastly events in Ankara on Saturday reflect the desperation of the Erdogan regime. Regimes that resort to this sort of atrocity do not last very long. The best thing that Turkey could do under the circumstances would be to ask the United Nations to supervise a plebiscite to allow Kurdish-majority areas to secede if they so chose. The mountains of southeastern Turkey with the highest concentration of Kurds are a drain on the national budget and of no strategic importance. Neither Erdogan nor his nationalist opposition, though, will consider such action; that would undermine both Erdogan's neo-Ottomanism as well as the old secular nationalism. The pressures under the tectonic plates will only get worse. Saturday's bombing may have demarcated the end of the Turkish state that arose out of the First World War.